Reigning WWE World Heavyweight Champion Batista and Shane McMahon will be on hand this Sunday for fans in Wellington to get photos and autographs. The pair will be in the country to promote the WWE SmackDown Road to Wrestlemania 22 Tour, and will appear in Wellington on Sunday after Saturday’s media appearances in Auckland. 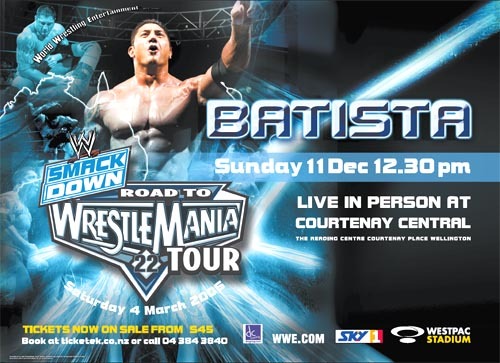 Batista and Shane McMahon will be in-store on Sunday, December 11, at Courtney Central (Reading Theatres, Courtney Place) between 12.30pm and 3pm.